I have always been afraid of dogs. I remembered being chased by stray dogs when I was little. So, when I see dogs, I feel fear and I think they sense it too. Ever since I became a mom, I had to pluck up my courage and overcome my fear of dogs. I did not want my kids to grow up fearing dogs. And now i don’t have the instinct to run away at the mere sight of dogs and can even volunteer at a nearby dog shelter with my son. I have even fallen in love with the big dogs. Like German Shepherds. They may look intimidating but they can also be kind and gentle. Just this weekend, I watched the movie Megan Leavy, a true story about the friendship between a marine and a military combat dog. It was so touching. Inspired me to sketch the dog. Never sketched a dog before. I really enjoyed it. My son who loves German Shepherds, thought I did pretty well! Maybe I will gift this drawing to him when he leaves for College next year… maybe I can try painting one too? Very good job! One would never know you hadn’t sketched dogs before! I find them difficult to draw. However, I’ve always loved dogs, any dog, and now I belong to a dog rescue. They love you unconditionally….. Truly lovely! 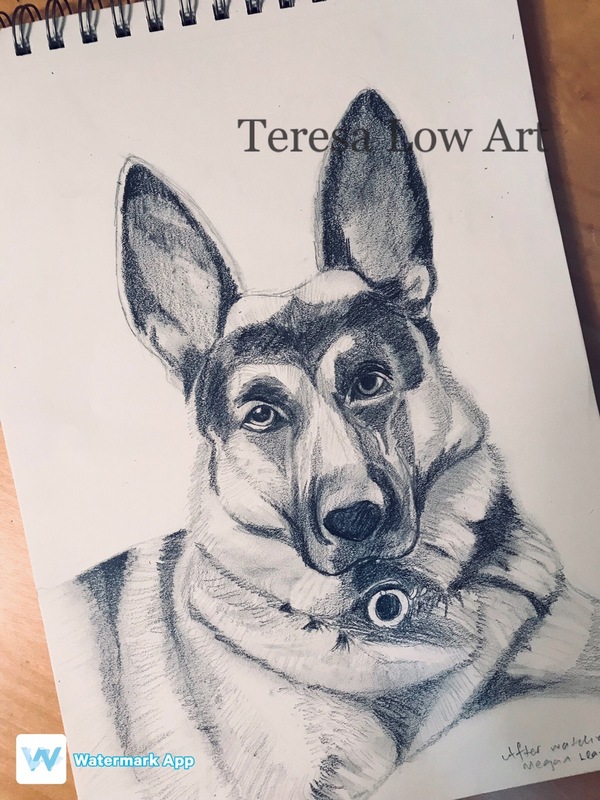 You’ve done such an amazing job of capturing the dogs essence — his soul, his personality and even the texture of his fur!